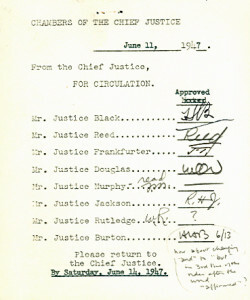 Mimeographed memo, issued from the “Chambers of the Chief Justice,” endorsed with the initials of the eight associate justices of the Vinson Court, next to their printed names, one page, small octavo, June 11, 1947. The associate justices’s initials indicate that they have “approved” the item which was circulated. 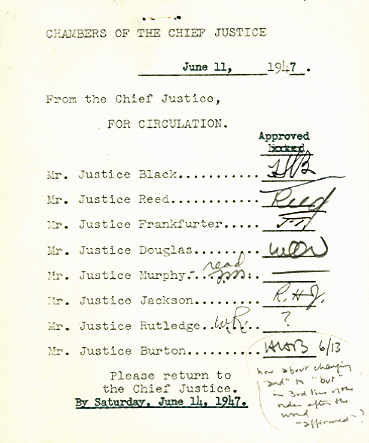 Signatures represented are Justices Black, Reed Frankfurter, Douglas, Murphy, Jackson, Rutledge and Burton.